Sometimes I do silly things like swear off wine for a month. Not necessarily a bad resolution in itself. Wine consumption in the soon-to-be Schatteman household tends to go in cycles: a week or two where we open a bottle every other night, or, more recently, swear off spirits entirely for a week. When I was in Minnesota earlier this month, I got into the habit of having a drink or two every night, and I came back to Connecticut feeling like it was time for a little cleanse. Or a big cleanse. Steve is usually on board with my crazy ideas (yes, not drinking wine for a month is, indeed, crazy), so when, on September 9th, I declared sobriety until October 4th, when we depart for birthday/Red River Rivalry week in Dallas, he happily jumped into the pool. Then Stevie broke his collar bone, rendering us somewhat housebound. And I realized how many days it is, exactly, until early October. And that there is no prize for deprivation. And that I achieved the cleanse I felt I needed after just a week. 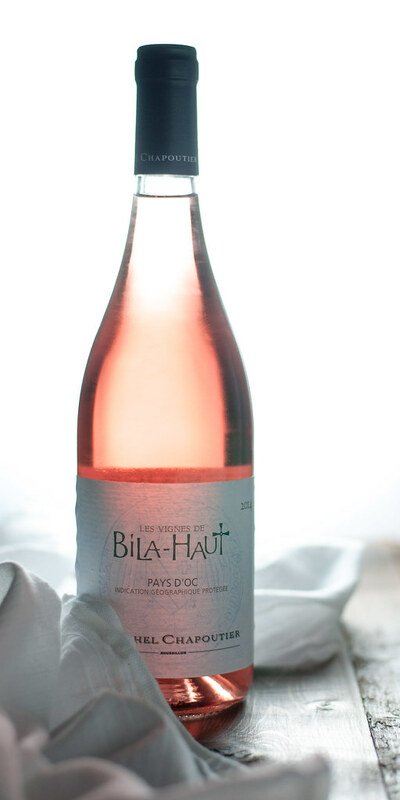 And, above all, that we just restocked the rosé supply! But, as weather turns cool, at least in the morning and evening, I’m much more likely to pop the cork on a big, juicy Pinot Noir than on summer’s refreshing rosé. Steve supplied the obvious solution: you cook with it. Duh. So it was all, “rosé risotto, here I come!” To answer your obvious questions, the risotto does not turn out pink, and I noticed only a slight difference in taste using rosé, versus the traditional white wine. Above all else, it’s fun and resourceful when your wine stockpile is predominantly pink. 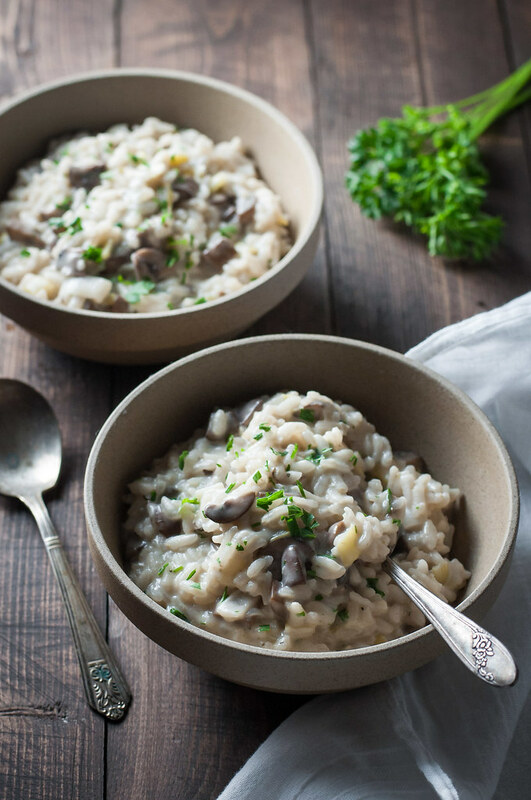 To round out the risotto, I combined it with a recipe that me and Tor made last spring at her house in Oklahoma, with mushrooms and leeks and–yay–goat cheese. To really pump it up, I paired mushrooms with plenty of their favorite aromatic: garlic. I infused the oil with it before cooking the mushrooms, put some more in the risotto, and even sprang for garlic and herb goat cheese, which my taste buds assure me is right up there with the invention of Papa John’s garlic sauce. Last but not least, I put an egg in it. I have to talk about it, because I know it’s potentially a source of great consternation in an otherwise lovely risotto recipe. I’ll tell you a little secret: the day after I made this risotto, I transformed it into perfectly fried little cakes which will come to the blog very shortly. But, last time I made risotto cakes, they were a little floppy, not holding together too well as I constructed them. If egg can get baked goods to stick together, it should do the same for a risotto fritters, right? That was my reasoning, and I was filled with total and complete fear that I would ruin the whole pot of tender rice as I tempered that egg before tossing it in. My fear quickly dissipated, though, when I saw that the egg didn’t at all try to scramble and lent the most silky smooth, carbonara-like texture to my fresh made risotto. I’m not sure that the egg achieves a fully cooked temperature during the process, so my advice is to use the best eggs you can find for this purpose. Organic and cage-free are good, fresh is amazing, and, if you have them (I did not), local is fantastic. And if you have your own egg-laying chickens? Then I am supremely jealous of how your rosé risotto is about to turn out with that freshly plucked egg. I know that not everyone has made risotto before, or knows what it means to temper an egg, so I tried to use normal words in the recipe. If you follow it, even if you don’t realize that what you’re doing is tempering an egg, your dish will turn out. As I learn cooking terminology, I like to use it, but I think it’s important to be down-to-earth at the same time. My recipes range broadly from simple weeknight dinners to extravagant party food, but they’re for everyone. I really do love to hear about you trying new things in the kitchen. 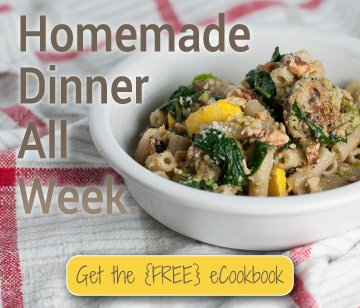 You don’t have to become a gourmet chef or a food blogger, but putting a homemade dinner in front of yourself and your family or community unit is about as human and essential as it gets. 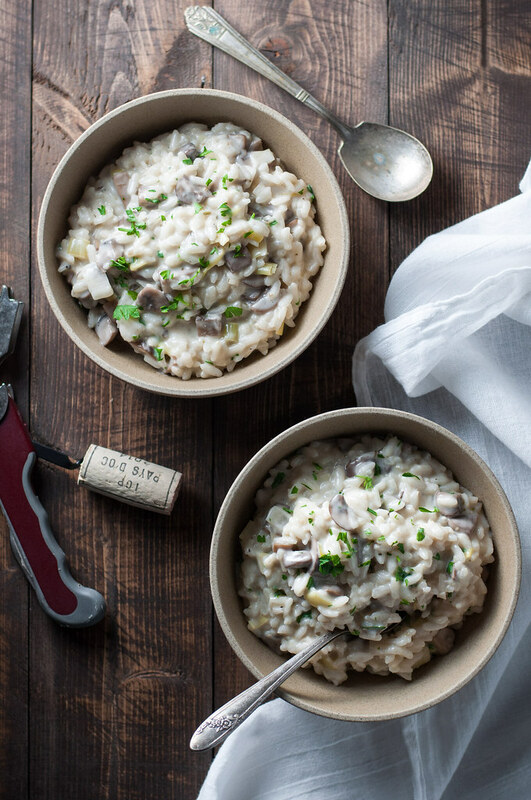 If that dinner is mushroom rosé risotto…all the better! Any kind of fresh mushrooms, or a mix, would be great here. I kept it simple with baby bella mushrooms, to get a little darker final color on the sautéed mushrooms. 1 lb. mushrooms, cleaned and diced ¼ to ½"
In a medium Dutch oven, heat 1 tablespoon oil over medium low. Add smashed garlic cloves and cook a few minutes to infuse the oil, until golden brown on both sides. Remove garlic, increase heat to medium, and add 1 tablespoon butter. Once butter melts, add mushrooms and toss to coat. 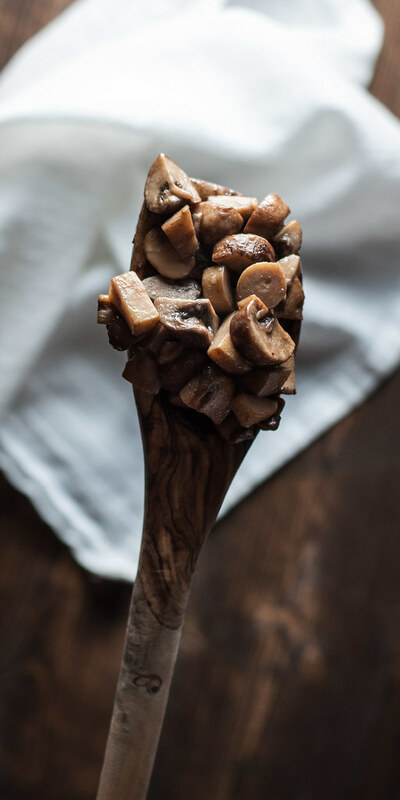 Stir only every few minutes as mushrooms release liquid and then it evaporates completely, and mushrooms are tender. Season to taste with salt, remove to a bowl, and set aside. Bring broth to a simmer in a medium saucepan, then reduce heat to low to keep warm. Take the egg out of the fridge and set aside (don't crack it yet). Crumble goat cheese and set aside at room temperature. In the same Dutch oven, heat remaining oil and butter over medium until butter is melted and just bubbly. Add leeks and sauté until soft but not browned, then add garlic and cook 30 seconds. Add rice. Cook and stir constantly 2 to 3 minutes, until rice grains are translucent at edges. Add rosé, adjust heat to a gentle simmer, and cook until fully absorbed, stirring almost constantly. Add about ¾ cup of the warm broth (use a glass liquid measure or ladle to transfer) to rice and adjust heat as needed to simmer, stirring constantly. When excess liquid is almost gone, add more broth. Repeat this process, starting to taste the rice after using half the broth. Continue adding liquid until rice grains are tender and edible but not overly soft. Reduce heat to low then stir in mushrooms. Beat egg, then continue beating vigorously with a fork or whisk while pouring in ⅓ cup of remaining warm broth. Add egg mixture and goat cheese to risotto, stirring until goat cheese is melted and well incorporated. Season to taste with salt (about 1 teaspoon) and white pepper (about ½ teaspoon) and stir in chopped herbs, if using. Serve as an entrée in bowls topped with grated parmesan cheese and extra herbs. 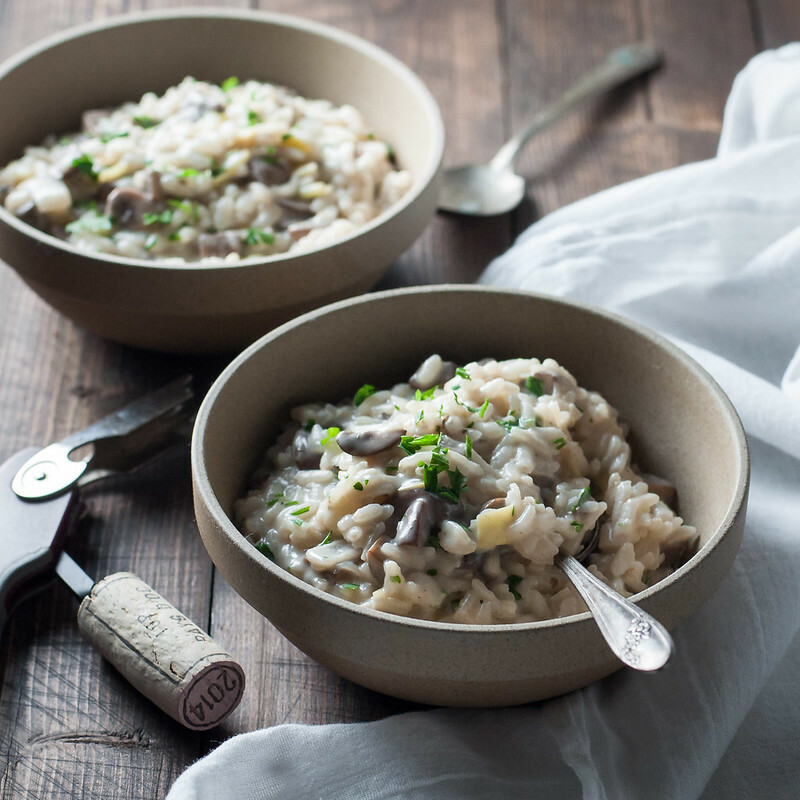 By using parmesan broth that I had in the freezer, I achieved a nice white risotto, which won't be the case if you use vegetable or mushroom stock. Regardless, the risotto is delicious! Every pot of risotto varies, but I used about 4½ cups broth, including the broth mixed with the egg. Thanks to the single source of assurance I found on the internet that adding an egg to my risotto might actually work. 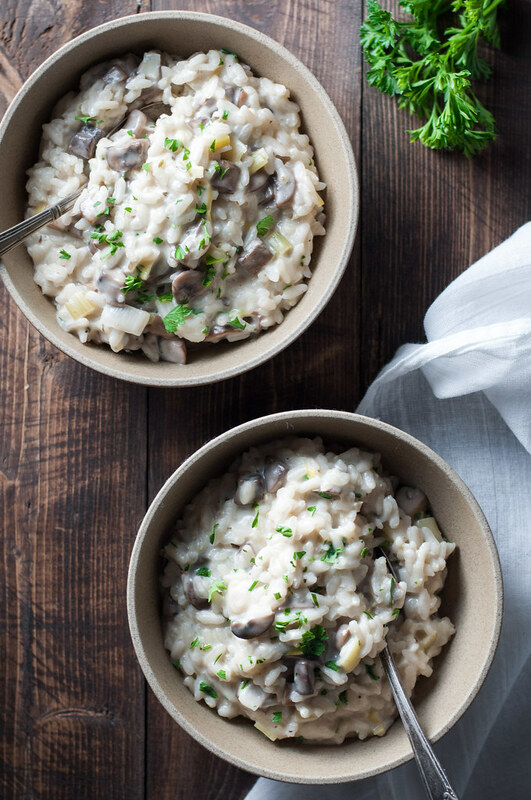 Risotto isn't the best dish to make ahead, but if you finish it a little in advance (i.e., just before company arrives for dinner), you can refresh it with more broth or some cream after keeping it warm in a covered pot over low heat (or in a low oven). For a hands-off oven baked risotto, check out the filling in this stuffed peppers recipe! Note: This page contains affiliate links. It does NOT contain sponsored content. Affiliate links (to products I recommend, on Amazon) offset my ingredient and website maintenance costs, so I can keep bringing you winey recipes like this one. Thanks! So jealous of your egg situation Adina. Let me know what you think! I just want to say I’m new to blogs and definitely enjoyed this web blog. Almost certainly Iâ€™m want to bookmark your blog . You really come with awesome writings. Appreciate it for sharing with us your blog.